Our homes are important to us. If you own a home in Marion, MA, you do all you can to keep the property in good condition so you can enjoy it for years to come. For you, this means keeping up with the chores such as cleaning the exterior when it is littered with debris. You'll be faced soon with great weather which is prime time to start getting the house fixed up to enjoy it this summer. The thought of being outdoors to enjoy some warmer weather is probably on everyone's mind since we've been cooped up over the last few months during the winter season. But now it's time to examine the exterior of our homes and think about what repairs or maintenance is needed. You probably have some roof debris and stains that need cleaning up. You may need some house washing or exterior window cleaning. You can get help from At A to Z Softwash. We offer roof cleaning and pressure washing services to Marion. 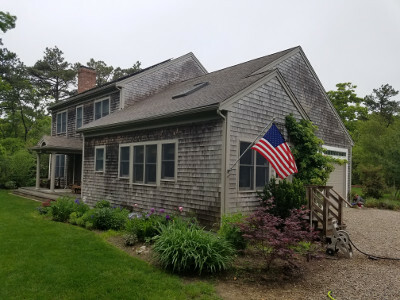 Our Cape Cod Roof Cleaning professionals are ready to help you clean and restore your home or business. From your roof all the way to the curb, we'll get your property restored and looking sharp again! When you're interested in having someone clean up the exterior of your home, you want a company with a good reputation that provides quality, honest work you can rely on. We've been helping local homeowners since 2012 with all their exterior cleaning needs as well as fence cleaning and tile cleaning. When you need a professional Marion roof cleaning or pressure washing service, just give us a call and we'll come out to offer you an estimate. Grease can really build up in a commercial kitchen. Especially in the exhaust vent hood over the stove. It's important to thoroughly clean the hood to keep the grease from building up. Once it's coated with grime and grease, it's a fire hazard. The hood cleaning process is extensive and takes professional tools to accomplish properly. Our pressure washing team is trained and equipped to get your hood cleaning job done safely and effectively. We can set up a regular schedule to keep your Marion kitchen hood cleaned. This is important to stay in compliance with local and national safety code regulations. Call today for a competitive estimate. If you are looking for a Marion, MA roof cleaning and exterior pressure washing service, please call 508-209-7795 or complete our online request form.